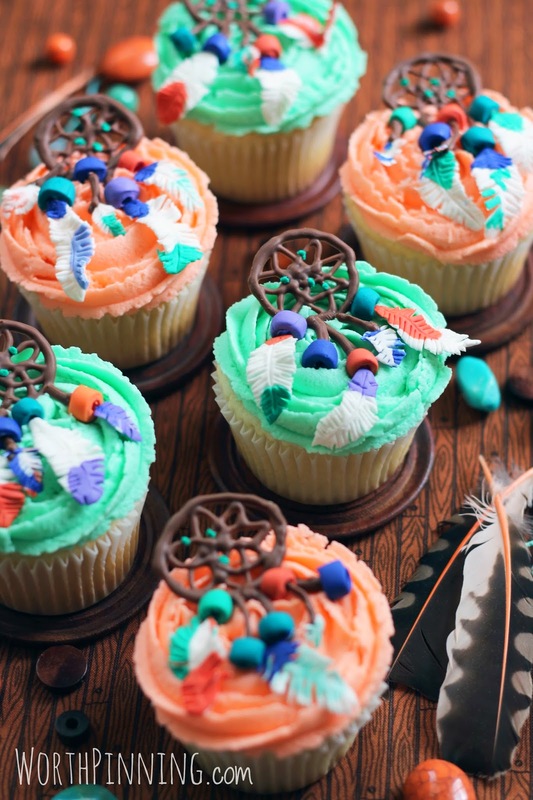 I wanted a cake, but I knew cupcakes were more realistic. I can justify eating a cupcake. I can't justify eating a whole cake by myself. I usually run when I'm feeling stressed, but sometimes I want to bake instead. Working on fine sugar details helps me disappear into the process. 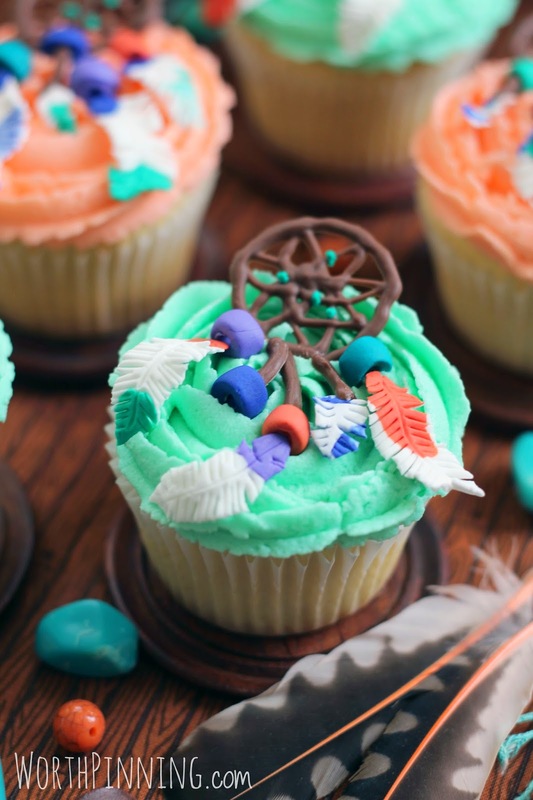 I ended up with these beautiful dream catcher cupcakes and absolutely no occasion to serve them. 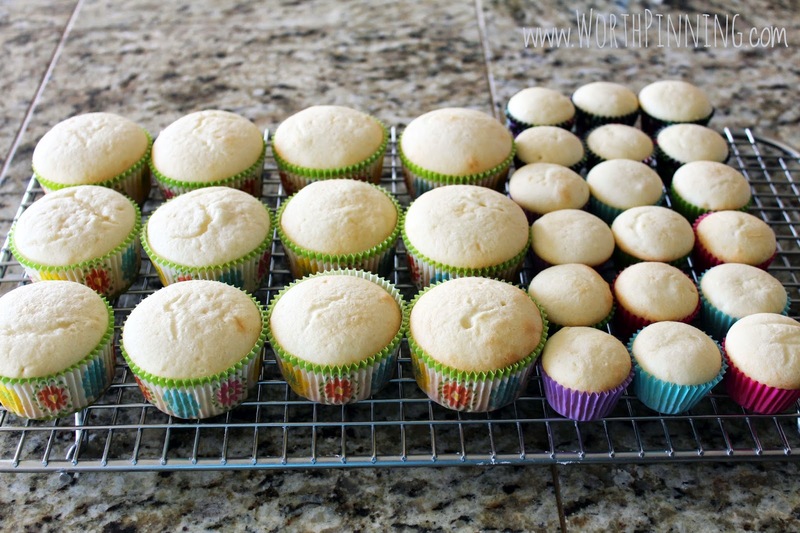 Start by baking a batch of your favorite cupcakes. I chose white cupcakes to go with the pastel frosting. After getting the cupcakes in the oven, I started to color gum paste: purple, teal, dark teal, dark blue, orange and red-orange. Using a sharp Xacto, slice diagonal lies on either side of the feather. Gently pull the feather from each end to separate and place on an uneven surface to contour like a feather. I had half a bag of Easter M&Ms folded over and placed the feathers on the bag to dry. I removed the feathers once they were dry and they hardened with nice curves and arches. 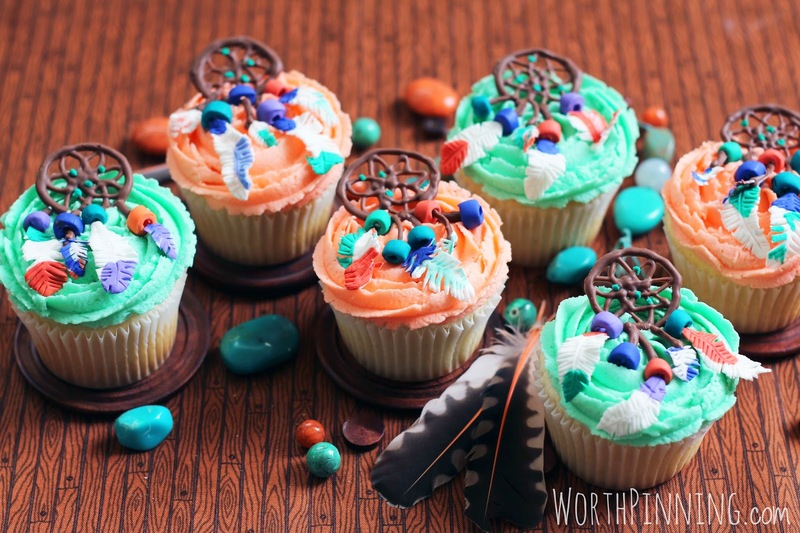 Roll each color of gum paste and slice in small sections for the beads. Use a sharp tool and poke it through either end to create a hole. They look like colored Cheerios. I quickly sketched a dream catcher to follow as a pattern. The sketch is on parchment with a piece of wax paper on top for piping. Work quickly- the chocolate will begin to harden. I also piped some straight lines and curved lines to look like leather straps and placed some of the tiny feathers at the end of the chocolate to harden. Now it's time to decorate the cupcakes. I made a buttercream frosting and colored half mint and the other half peach. Mint = Sky Blue + Green Leaf + Lemon Yellow. To pipe the roses, start in the center of the cupcake with the tip upright. 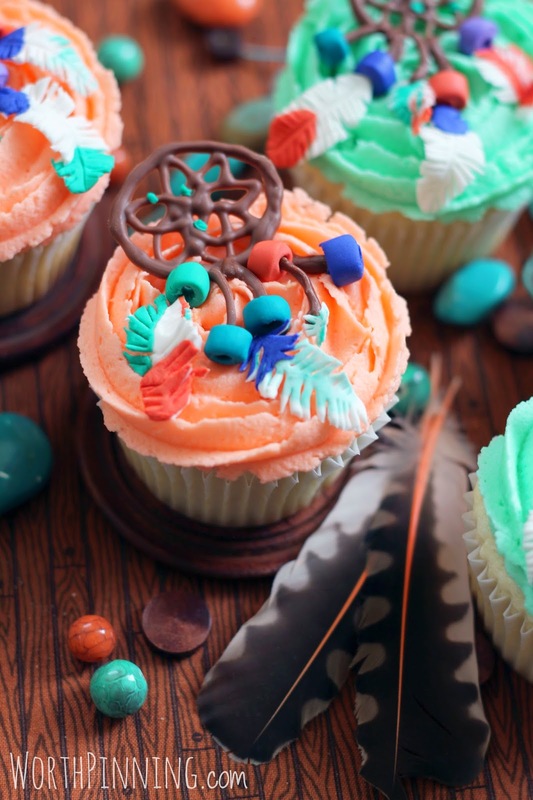 Begin to swirl the piping bag from the center and work your way to the outside of the cupcake. 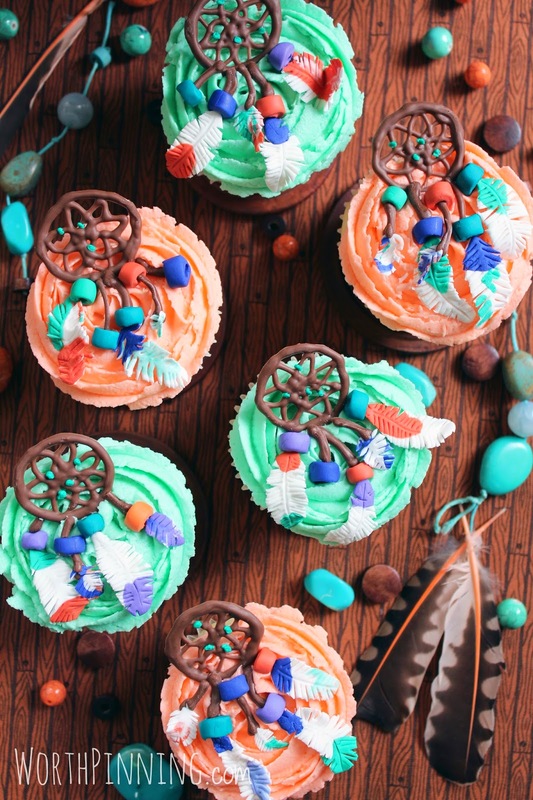 Now place the chocolate dream catchers, beads, feathers, etc. 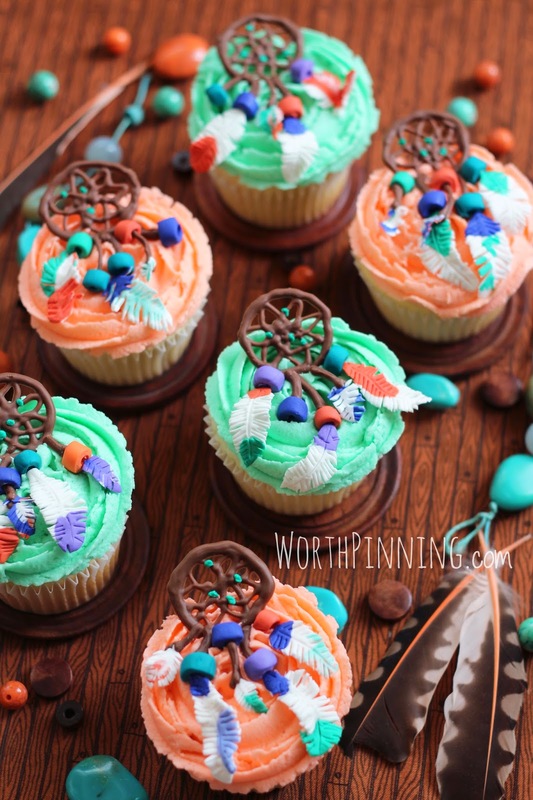 The feathers are very delicate so work carefully when placing them on the cupcakes. Dream catchers filter out the bad dreams and allow only good thoughts to enter the mind. By morning, the bad dreams disappear. I headed out to my favorite place and ran the trail all the way to the end. My mind cleared taking in new views and sounds. The trail changes each year, but it is still the same. Much like us. Follow Worth Pinning on Facebook. These are adorable! What a cute idea!